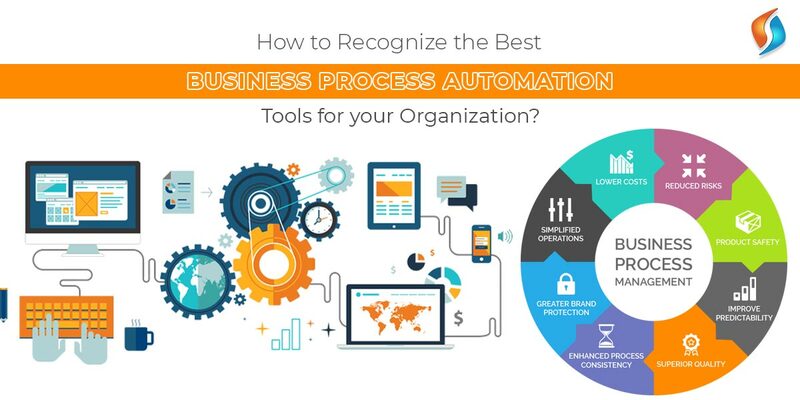 ﻿ How to recognize the best Business Process Automation tools for your organization? How to recognize the best Business Process Automation tools for your organization? In the modern business world, no company can afford to stay away from technology. The rising levels of competition and complexities make the integration of technology necessary. The technology could be disruptive or innovative depending on its potential. Whereas disruptive technology is always innovative, innovative technology need not be disruptive. A disruptive technology completely changes the company’s approach to business. When it comes to Business Process Automation (BPA), it could be either of these two. Most of BPA tools are innovative as they replace the existing technology. But in some cases, BPA tools could be disruptive also. This holds true for industries like insurance, finance, HR and likewise. BPA tools can disrupt the way these industries function. These tools can complete the processes that otherwise take days to complete in a few minutes. This is a primary reason behind companies opting for business process automation services. With the expertise of business automation consultants, companies are looking to streamline their operations. While implementing business automation solutions, it is necessary to identify best BPA tools. Here are useful tips to recognize the best BPA tools for your organisation. What are Business Process Automation (BPA) tools? Business Process Automation (BPA) involves automation of manual and paper-based processes. With BPA, companies can reduce costs and enhance the efficiency of operations with technology. These software solutions aim to help businesses optimize the routine processes. Thereby helping enhance the efficiency and productivity of their operations. Regular monitoring of various processes. How to recognize the best BPA tools for your Company? Many companies have dedicated IT teams to enhance their internal systems. Thus, while opting for a BPA tool, the skill set of the in-house personnel must need consideration. The vendor might claim that implementation of their BPA tool is effortless. Vendors might also claim that only some basic knowledge is essential for using the tool. And thus, if you do not consider the calibre of your in-house team, you might be in trouble. As it would need spending considerable time and resources on training your employees. Otherwise, you will have to opt for business automation consulting services. Forms are one of the most crucial interface element for a business process. It requires the input of correct information from the users for the forms to be of any use. Thus, the decision on the complexity of forms is very important while opting for a BPA tool. The form might have a simple drag and drop configuration or might need back-end coding. The level of complexity of a form also depends on the type of data required from the end user. The selection of the BPA tool must be done only after understanding the need of complexity of forms. In the present business environment, time is of the essence. Companies want the employees to be able to work from anywhere and anytime. Therefore, considering mobile functionality of the BPA tool is also very important. It could be the difference between the success or failure of a BPA system. Enterprise mobility solutions will provide you with Mobile-friendly forms and functions, which will ensure seamless adoption by the entire organisation. Also, the option of using GPS and the mobile camera can add new dimensions of functionality. The days of paper-based records are coming to an end. As companies do not have the time and resources to follow paper-based documentations. But there is no effective replacement for paper-based documents for certain tasks. Tasks such as contracts or agreements still need physical documents. Thus, when selecting the BPA tool, you must consider the feature for document creation. This will help create documents from the data automatically. Thereby reducing dependency on paper. Business landscapes are ever-evolving. The requirements of the business also keep on changing. There might be changes in the market scenario or statutory regulations. Businesses must follow these changes. Thus, while opting for a BPA tool, the company must consider the impact of business automation tool on the bottom line. The BPA tool must support the functionality of easy upgrade of processes. The tool must be compatible with future requirements. Because otherwise, there will be cost escalation and unnecessary delays later-on. Get the best Business Automation Solutions with us! The benefits on offer with Business Process Automation are beneficial for the company. Because going into the future, BPA is the only way ahead. Are you looking for professional business automation services? Then, your search ends with Signity Solutions. We are a leading mobility service provider in India, and we have been helping our clients from around the world with their BPA requirements. Our team has many years of experience in handling all types of BPA tools. So get in touch with our team on IT outsourcing services and let us help you with your business process automation requirements. Contact us now.